Welcome the 2017 Beach Dogs Lacrosse Summer Camp Program! ALL EQUIPMENT CAN BE STORED ON SITE IN THE BEACH DOGS POD. NO NEED TO LUG EQUIPMENT EVERY DAY. PLEASE HAVE A LABELLED BAG FOR YOUR EQUIPMENT. Out of respect for St. George’s School, please comply with the below Drop-off and Pick-Up procedures. We will be using the back entrance to the school only- look for the orange signs. All players must check in upon arrival and check out upon departure. 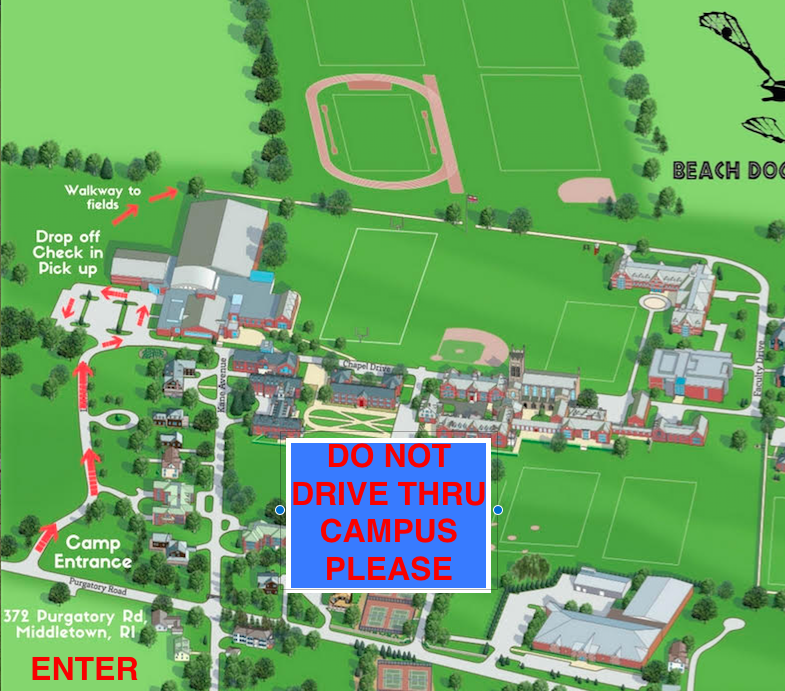 We will have counselors at the DROP OFF / PICK UP location (see map) each day for this. Please pull into the POOL/SQUASH parking lot and either park or drop off your camper. There will be camp counselors there to check the campers in. This is always a very busy morning! If you signed up for lunch and paid online then you are all set. If you did not pre-purchase lunch for your child and wish to do so you will have to check-in first and then there will be a lunch sign up table separate from the check-in line in order to keep things moving quickly. Sign up for lunch is for the full week only. Monday - Thursday we will have FLATWAVES and Friday we will take a vote to see if kids want Pizza. MONDAY. Please see your division for drop-off time -THERE IS LIMITED PARKING so we appreciate you complying with these times so drop-off goes smoothly. We cannot watch your child before the times below. You may drop your child between 8:45 and 9:15 at the designated drop-off location and we can check them in. After that we are all up at the fields. There is limited parent parking at the pool/squash lot if you want you can go park and then walk up to join your child. 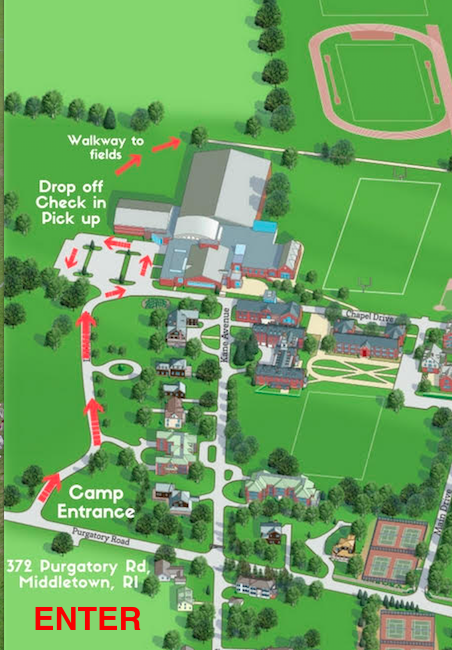 PICK UP MONDAY-THURSDAY- Counselors will be at the PICK UP/DROP OFF locations (see map) for the appropriate divisions. You will be able to drive-up and pick up your child (think school pick-up) or park and check them out. Remember this should be easier if they leave their bag at the POD. PICK UP FRIDAY- Player’s Games start at 12:00 noon- more details to follow. We are so excited to be using the St. George’s campus again this year. We want to be respectful of their wishes and therefore need to use only the parking marked. PARENT PARKING on the map while we are there. Again, there is limited parking so carpooling is appreciated. Please be cautious and RESPECTFUL when driving through campus. 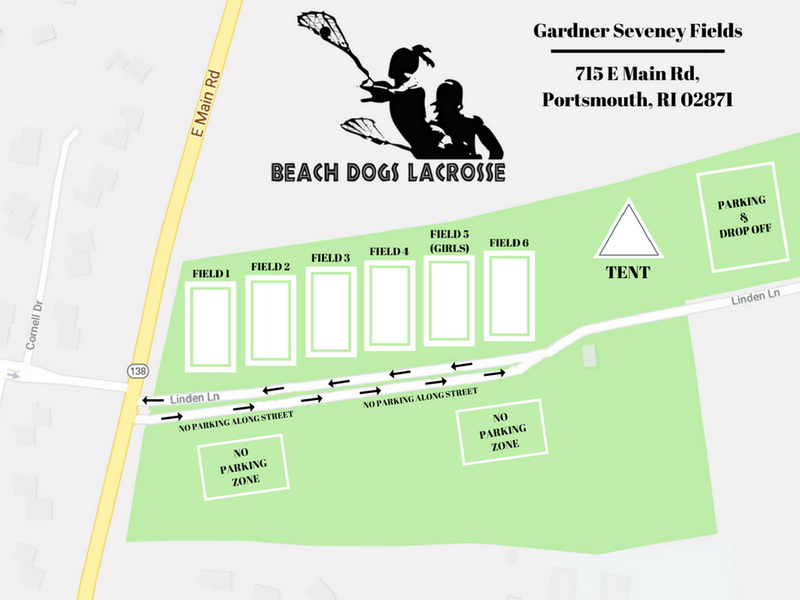 Beach Dogs Lacrosse Campers and families have been asked NOT to use the main entrance or hockey rink entrance. Tyler Hill - Iroquois Lacrosse Association and Hobart/Disney’s Crooked Arrows. Eat Breakfast before you arrive. The number one reason for fatigue and potential problems during the day can be avoided if you eat a good breakfast and drink some water. Bring your lunch and snacks if you did not sign up for lunch. Bring a water bottle - water water water! Water will be provided on each field to refill as needed. NOTE - after camp each day - drink water, it will hydrate you for the next day. Our welcomed guest coaches will be rotating through all the divisions sharing stories from the field and history from the “Creators” perspective. Throughout the week we will have various vendors on site to show off some new stuff. There will be a camp store selling mouth guards, gatorade, water for campers and camp apparel and Iroquois Stringing supplies. Campers can arrange to have their heads re-strung by our on-site stick doctors - cost $30. Please have a back up stick to use while your head is getting strung. Campers will be available to get tee shirts, autographs from the players. At the end of each day there will be a raffle where players can win lacrosse equipment, apparel, etc... Campers can earn raffle tickets by doing GOOD DEEDS on the field and off. Each year Beach Dogs Lacrosse tries to do something to better the world we live in. Sometimes it’s local like Boys Town RI or close by like the Mashpee Wampanoag Tribe. This year for the 5th time we welcome HARLEM LACROSSE and Leadership. We will have 12 exceptional middle and high school students joining us for the week. We have some outstanding volunteer families who are opening their homes for the week to make this all possible. Thanks to all who are giving of themselves. We look forward to getting to know the 8 boys and 4 girls coming from this incredible program. First Aid is located under the tent by the flag. We have a certified trainer on site all week. If your son or daughter has any medical condition, allergies, etc please plan to meet with the trainer on day 1 to make us aware. The trainer will be at check in the first day and then will be located at the field for the rest of the week. There will be wireless internet access on the field to be used by camp staff as needed. Weather is monitored locally as needed and any communications will be emailed to parents through out the day as needed. Incoming email will be monitored hourly. We do have access to the St. George’s Field House in the case of thunderstorms. If parents have questions or concerns they can email and expect a reply within an hour usually. Emergency communications will be by phone, incoming and outgoing. 401-965-9622 is the number to call. Voice mails will be returned urgently. Please note that if it is not an emergency please email. We discourage players from bringing valuables. Please have a bag for all your belongings and keep your stuff in it. Please put campers names on all items. There will be a lost and found. Welcome the 2018 Beach Dogs Lacrosse Summer Camp Program! Please see the map below for parent parking location. You may park and drop off your child at the main tent. Each player must check in with us so we can keep track of who is in attendance. On Day 1 they will get their field assignment and pennie and confirm lunch and any other special circumstances. We will have counselors at the DROP OFF / PICK UP at the main tent each day each day for this. For Tuesday - Friday you can have your child check in and out with their counselor upon arrival and before leaving for the day. As always, parents are welcome to stay and watch at anytime! Please check in at the main tent on day one with your player. You can park in the designated parking lot. Monday - Thursday we will have lunch provided by FLATWAVES (Hawaiian barbecue or burgers) and Friday we will take a vote to see if kids want Pizza. You may drop your child between 8:45 and 9:15 at the designated drop-off location and we can check them in. After that we are all up at the fields. Counselors will be at the PICK UP/DROP OFF locations at the main tent. Lunch is served early on friday and we will have our Games starting at 12: pm - more details to follow. We are so excited to once again be calling the Gardner Seveney Fields aka “The Glen” as our home for Beach Dogs Camp Week. We want to be respectful of this beautiful place with it’s natural beauty and history. Please remind your child to stay away from climbing on the stone walls that encompass the property and for parents to be cautious and RESPECTFUL when driving through. We will have a camp store with drinks. Hawaiian Jim’s will be on site at the end of each day. Each year Beach Dogs Lacrosse tries to do something to better the world we live in. Sometimes it’s local like Boys Town RI or close by like the Mashpee Wampanoag Tribe. This year for the 8th time we welcome HARLEM LACROSSE and Leadership. We will have 12 exceptional middle and high school students joining us for the week. We have some outstanding volunteer families who are opening their homes for the week to make this all possible. Thanks to all who are giving of themselves. We look forward to getting to know these players from this incredible program. First Aid is located under the main tent by the flag. We have a certified trainer from Olympic Physical Therapy on site for the week of camp. allergies, etc please plan to meet with the trainer on day 1 to make us aware. The trainer will be at check in the first day and then will be located at the field for the rest of the week. There will be wireless internet access on the field to be used by camp staff as needed. Weather is monitored locally as needed and any communications will be emailed to parents through out the day as needed. Incoming email will be monitored hourly. If parents have questions or concerns they can email and expect a reply within an hour usually. Emergency communications will be by phone, incoming and outgoing. We discourage players from bringing valuables. Please have a bag for all your belongings and keep your stuff in it. Please put campers names on all items. There will be a lost and found but at the close of camp any items remaining will be donated or disposed of.